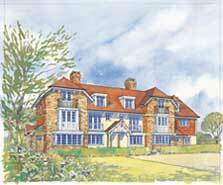 Summary Description Guide Price: £735,000 Freehold. A newly constructed LIGHT AND SPACIOUS DETACHED BUNGALOW with generous room sizes and luxuriously appointed accommodation, set within 3/4 of a mile of the village centre. Set back from Lower Green Road via a private road that just serves the three properties that form this exclusive scheme. The property is within 1/2 a mile of the village's highly regarded primary school, 3/4 of a mile from the village green and the A21 (which connects to the coast, London and the M25 orbital motorway). The area is generally well served by a variety of sport and leisure facilities. A light and spacious NEWLY CONSTRUCTED DETACHED BUNGALOW with generous room sizes and luxuriously appointed accommodation that affords a flexibility of use. 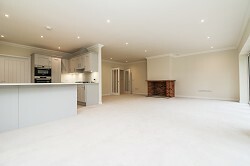 With open plan living space that features a high specification, fitted kitchen with granite work surfaces and integrated Bosch appliances linked to the terrace and rear garden by two wide sets of bi-fold doors. 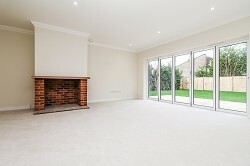 There is, in addition to three double bedrooms (one with en suite) a further useful study/4th bedroom. 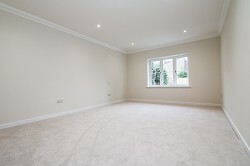 A bright and spacious hall with a wide shelved airing cupboard housing a lagged hot water cylinder, expansion tank, timer and programmer, as well as the manifolds for the underfloor heating. Window to the front. Low voltage spotlights on a dimmer. 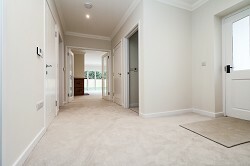 A delightful feature of the property having open plan areas accessed via double doors from the hallway. Dining Area Further bi-fold doors to the rear garden. Window to the side. Window to the front. Sink unit and adjacent working surface with plumbing provision and space for washing machine and tumble dryer set beneath. 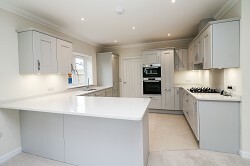 Suspended wall cupboards. Wall mounted Worcester gas fired boiler for the central heating and hot water. Electric consumer unit. Trade's door to the side. 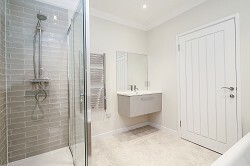 A white suite with chrome fittings comprising a bath, separate shower cubicle, vanity-style wash basin and WC. Tiled walls. Obscured glass window to the side. 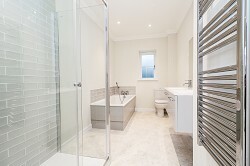 A white suite with chrome fittings comprising a bath, separate shower cubicle, vanity-style twin wash basins and WC. Tiled walls. Obscured glass window to the side. 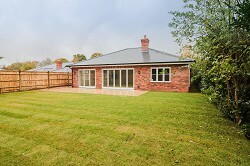 To the FRONTof the property there is a tarmacadem driveway which accesses the spacious detached GARAGE, also partially weatherboarded under a pitched slate roof, with light and power connected and eaves storage. 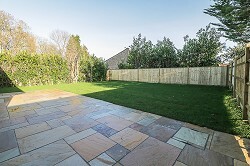 Accessed via a path to the side is a level REAR GARDEN with a large Indian stone patio area accessed from the reception room. 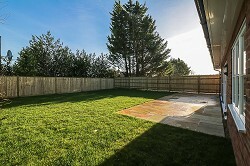 The remainder of the garden has newly laid turf providing a flat lawned area and closeboarded fencing to its boundaries. From our office in the High Street proceed northbound taking a right hand turn at Hooper's mini-roundabout and continue up Grove Hill Road and bearing left into Prospect Road. At the traffic lights proceed straight over joining Pembury Road. 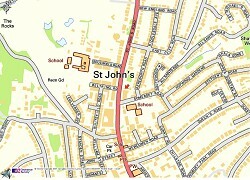 Turn right into Pembury High Street and left into Lower Green Road and take the fourth turning right into Romford Road, just before the Baptist Church. At the T-junction turn right into Henwood Green Road and the entrance to the scheme will be found on the left hand side between Nos. 98 and 96, marked by our ‘For Sale’ board. (ii) All dimensions, distances and areas are approximate, and references to condition and necessary permissions for use and occupation and other details are given in good faith and are believed to be correct, but any intending purchasers or tenants should not rely on them as statements or representations of fact but must satisfy themselves by inspection or otherwise as to the correctness of each item. (iii) No person in the employment of BRACKETTS has any authority to make or give representation or warranty whatsoever in relation to this property. VAT: Rents, Prices or any other charges quoted are exclusive of VAT, unless stated to the contrary. (iv) Prospective purchasers or tenants are strongly recommended to satisfy themselves as to the working order of the main services, various electrical or gas appliances, plumbing, drainage, alarm or other systems or appliances. Whilst these may be mentioned in the particulars, they have not been tested by the Agents.